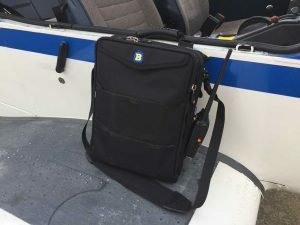 I’d seen quite a few BrightLine bags around the airport, but I’d been hesitant to invest in a new gear bag because I was already using a pretty pricey MyGoFlight PLC Pro flight bag. 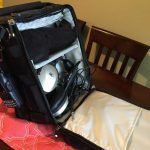 The PLC Pro is a great medium-sized bag, but it was still a lot bigger than what I was aiming for. So, after scaling down with the QT Halo headset, I finally decided to go all out and buy the BrightLine B2 Compute bag. The thing that makes BrightLine bags unique is their FLEX system. The back section of the BrightLine bag – home to my iPad. BrightLine bags are modular. Individual pieces zipper together to create whatever size bag you want. The front section of the bag features a series of sectioned pockets — 10 of them in total. The back has a large iPad pocket, as well as another front pocket that doubles as a band to attach the bag to rolling luggage. In between those front and back sections, BrightLine makes a wide array of center sections in varying sizes. The configuration I bought, the B2, comes with a super compact 2″ center section. That sounds like a pretty small bag — and it is. But for some paperwork, a QT Halo headset, and a kneeboard, it’s actually more than enough room. The center section of the B2 bag is small, but big enough for my instructing gear. The thing that makes the BrightLine a game-changer, though, is the modular design. For instance, the bag I bought was really two bags — I could use it as-configured, or take out the center section and zip the front and back compartments together to form an ultra-slim B0. When I was in the San Francisco Bay area not too long ago, I stopped by an awesome pilot shop called San Carlos Aviation & Pilot Supply and picked up the 4″ center section. 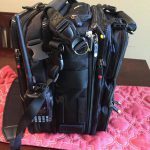 That piece can zip in between my front and back sections to make a normal-sized flight bag that’s capable of carrying larger headsets like the Lightspeed Zulu.2s, and a change of clothes. Or, I can combine it with the 2″ section to have 6 inches of storage space in between the front and back sections. So I basically got four flight bags in one. The best part of the BrightLine FLEX system is that I can basically switch bags without needing to move anything out of all of the pockets in the front and back sections — everything stays put, and I can have a drastically different-sized bag depending on my mission. It’s really brilliant. Another big plus is that if your typical mission changes (or if a component breaks), you can simply buy an additional piece instead of a totally new bag. The front section is the workhorse in terms of storage. It’s deceptively spacious. There are three large pockets stacked on top of each other, but they’re really 10 pockets because of the way they’re separated by zippers. 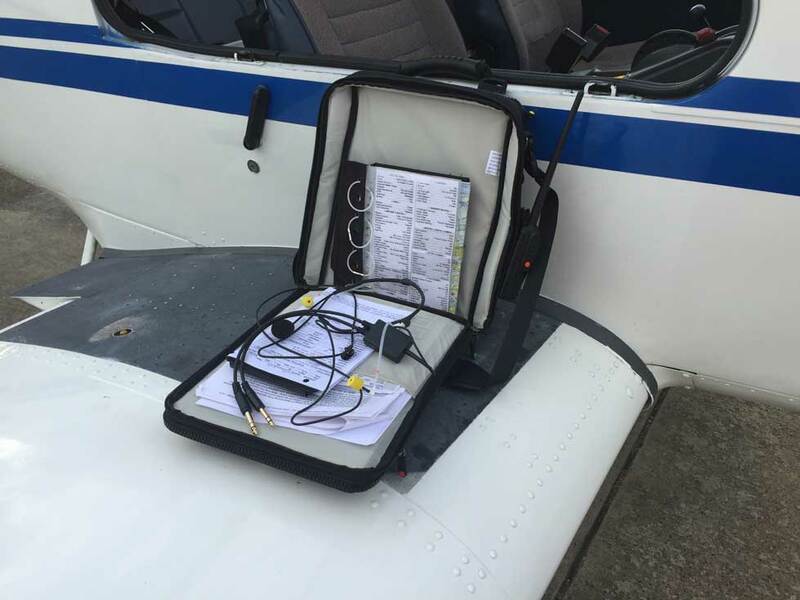 What’s really impressive is that, despite the super low-profile of my standard instructing bag, I’m still able to carry a bunch of extras like a pulse oximeter, flashlights, and a Square reader (for accepting credit cards for flight instruction) in that compact package. It really wasn’t a compromise between size and carrying ability, which is pretty amazing. I’ve only been using the BrightLine bag for a couple of months now, but build quality appears to be good. 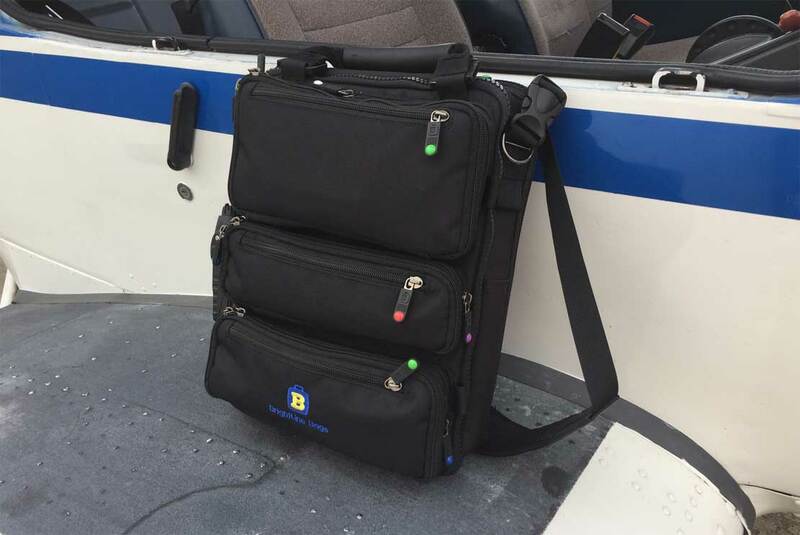 The bags use pretty heavy-duty zippers to connect sections, with more standard-sized zippers to open the compartments and pockets. The large, heavy-duty zippers that connect the different sections were a little stiff when I first got the bag, but they’ve become easier to zip as I’ve broken the bag in. Otherwise, no big surprises to report. I ordered the bag directly from BrightLine to take advantage of the 10% discount they offer to CFIs who are members of SAFE. A bit after I ordered, I realized that I forgot to buy the slim handle kit that I’d need if I wanted to use the B0 Slim configuration — so I called to see if I could add it to my order before it shipped. They were super nice on the phone and actually included the kit with my shipment free of charge. Thanks BrightLine! That’s the kind of amazing customer service that makes me feel confident spending money with a business — I feel reassured that I can buy BrightLine’s gear, and they won’t nickel and dime me if something goes wrong and I need support. The BrightLine B0 Slim Configuration — big enough for an iPad and an in-ear headset. The BrightLine B4 config — this is a “normal” sized setup. I’m still missing the side pocket accessories. 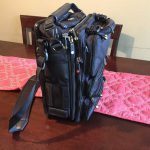 This isn’t an official BrightLine setup — but it’s the monster-sized bag you get when you zip the 2″ and 4″ center sections together. The inside of the 4″ center section, with a Lightspeed Zulu.2 and some winter gear up top. Ultimately, I think that the BrightLine bag system is about as close to a perfect flight bag as it gets. Currently, full bag configurations start around $97 for the B0 Slim, and you can either buy completed bags from them or add on individual components to suit your mission. Thanks for your honest and direct review which helped me decide on a new bag. Although I’m not a pilot in any sense of the word, the modular set up met my needs perfectly. I’m a self employed consultant in crisis management. A former British Airways (there’s the only aviation link!) security manager I know the flying game pretty well. I needed a bag that could take all my usual tools of the trade and travel light. Here’s how Brightline worked well for me; I flew from Aberdeeen, Scotland to Dublin, Ireland on an ATR 72-600. Small cabin and limited overhead locker space. The ground staff wanted to take my bag for the hold, however, with a quick zip-off I had a smaller cabin bag and a laptop bag to go under the seat. I met the requirements and everyone was happy! As for the compartments, well they are brilliant! Loads of space, easy access to you kit and room for spare clothes for an overnight stop. 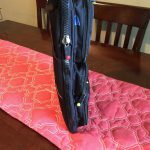 I have the FLEX assembly of two outer panels, 2″ and 4″, plus handle and shoulder strap. I’m going to expand to add a 5″ section just for clothes when laying over for a couple of days. As said in the original review, it’s modular, so a quick zip and you have a different bag for a different day. Expensive? Yes, and maybe slightly overpriced. I certainly had a pang of guilt ordering on line, however, when travelling you know it was money well spent.